This picture is from Hinkley's site ~ an interesting application shot. 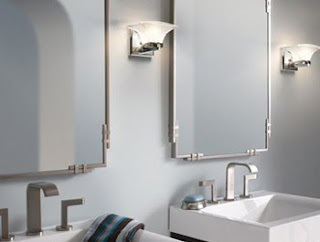 Theirs match a lot of what Joe mentioned on the webinar yesterday ~ a vanity light (over the sink & mirror) should be mounted about 80" off the floor. If you are using a pair of sconces, they should be mounted 66" off the floor, and ideally 30-36" apart, if your space allows. 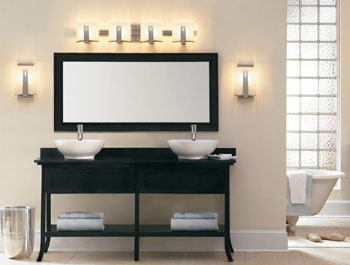 You should avoid using recessed lighting exclusively at a vanity ~ it creates terrible shadows under the eyes and chin. 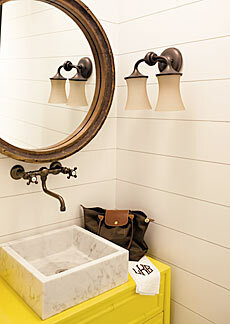 I personally love to pair a low-voltage pinhole light over the sink with sconces or a vanity light. The pinhole light will accent the sink and hardware and make them pop, while the vanity light or sconces will light your face. And don't forget a recessed light in the tub or shower. The technologies have developed nicely in the past few years, and we can now use low-voltage MR16 or line-voltage PAR lamps (both halogen) in wet locations, so again, you can achieve a great pop of bright light in these areas. And don't forget to put all your non-fluorescent lights on a dimmer! Dimmers will save energy and extend the life of your light bulbs tremendously.